Sometimes you have to just close yourself into your sewing room, try to block out the world, and just make. This weekend I closed myself in my sewing cave and emerged on Sunday with a new pair of jeans and a teeshirt. Let's start with the jeans - I've lost track, but these are probably at least the 10-15th pair of jeans I've sewn myself, so I pretty much know what I want and how to achieve it by now. I usually try to make at least a pair a year, as they seem to live for just over a year of hard wear before the inner thighs inevitably start to wear thin and they're relegated into "boat work jeans". Sometimes you have to just close yourself into your sewing room, try to block out the world, and just make. This weekend I closed myself in my sewing cave and emerged on Sunday with a new pair of jeans and a teeshirt. Let’s start with the jeans – I’ve lost track, but these are probably at least the 10-15th pair of jeans I’ve sewn myself, so I pretty much know what I want and how to achieve it by now. I usually try to make at least a pair a year, as they seem to live for just over a year of hard wear before the inner thighs inevitably start to wear thin and they’re relegated into “boat work jeans”. 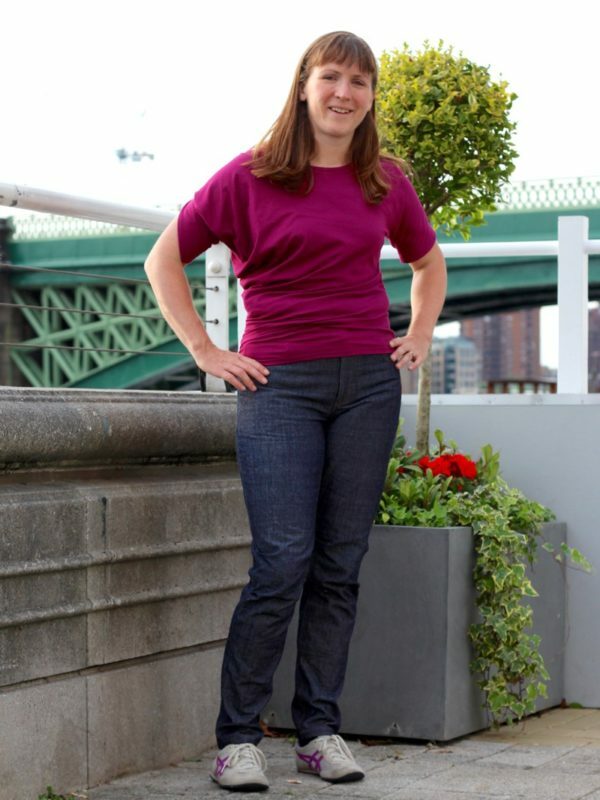 I’ve been wearing the pair I made last March heavily since then, and since I started cycling to work in January, I’ve been thinking of a few ways I could tweak my next pair to make them even more cycle-friendly (while still looking mostly like “normal jeans”). 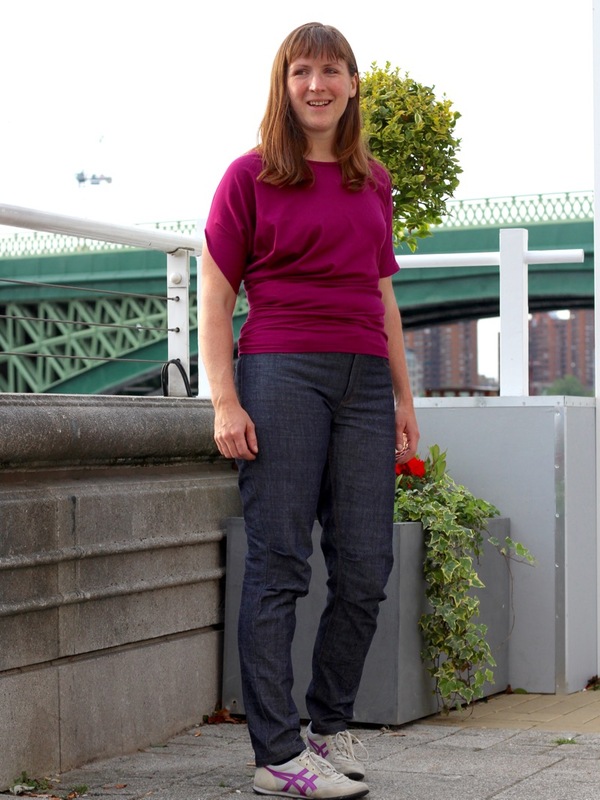 Knee pleats for added ease in cycling! I tested a few of the concepts in a pair sewn in an aqua Japanese twill covered in cats a few months ago, but some of the features I ultimately rejected (like shifting the inseam forward for greater range of motion), some I modified (like moving the knee pleats down a good 6 inches! ), and some I kept the same (like lengthening the legs and increasing the back rise to account for a seated cycling stance). The cat pair were only meant to be a fun but wearable muslin, and they’ve done their job admirably! Use Gutermann “Upholstery” thread (AKA “Extra Strong”) in the grey spool, NOT the “Topstitching” thread (in the green spool), which is often too thick for your machine. And use regular thread in the bobbin. I didn’t say it makes sense, just trust me on this. 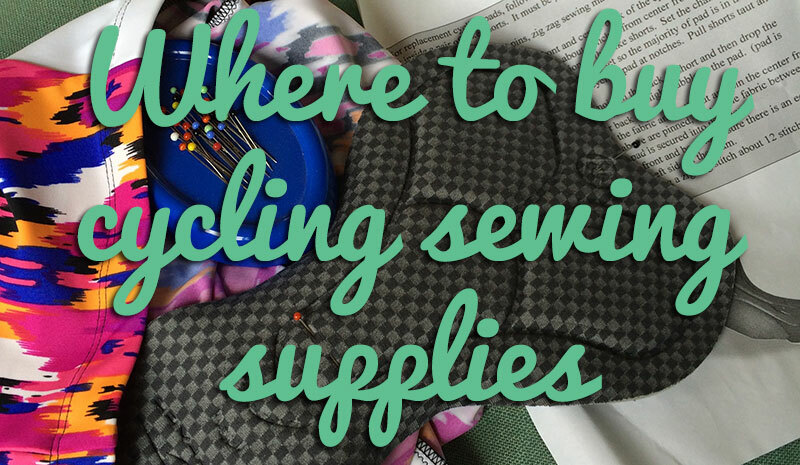 Use quilting cotton for pocket linings, waistband facing, and the fly shield – it cuts down on bulk and is a nice touch that’s “just for you”. Also it’s a nice way to use up random scraps! 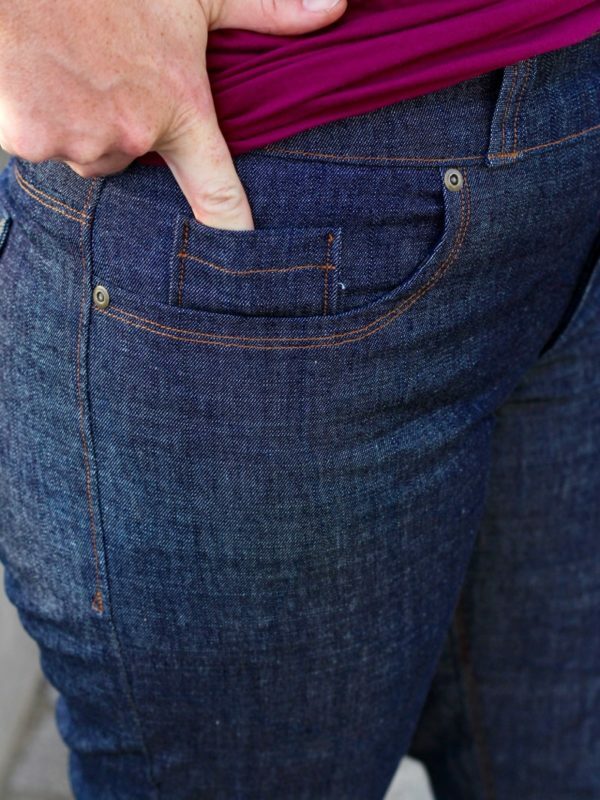 Throw away whatever jeans rivets you bought from that sewing shop. Yes, throw them in the bin right now. They’re terrible quality, will come apart as you wear them, and likely rip holes into your coat linings and tops (yes, really). It’s just not worth it. 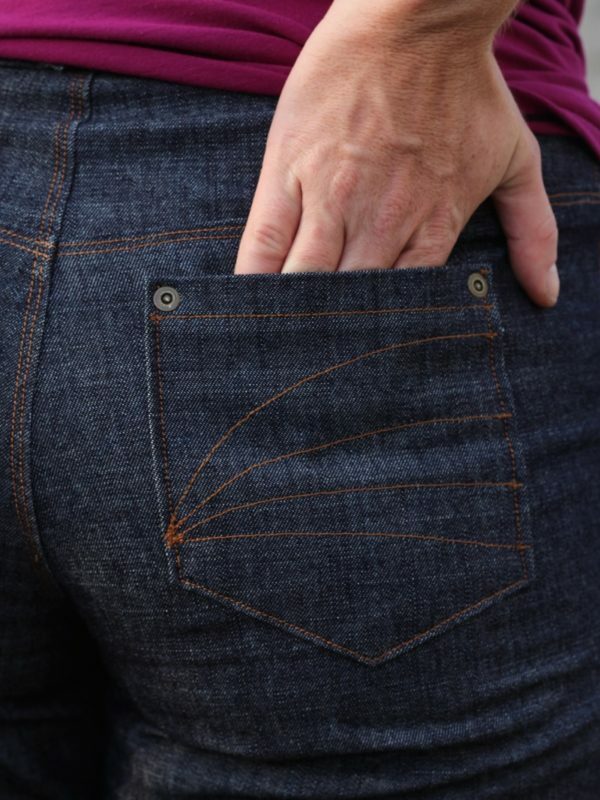 These rivets are the best quality – exactly like ready-to-wear jeans, and I have yet to have any fail or damage my clothing. I wrote a tutorial about how to install them here, as trimming the nail is key! 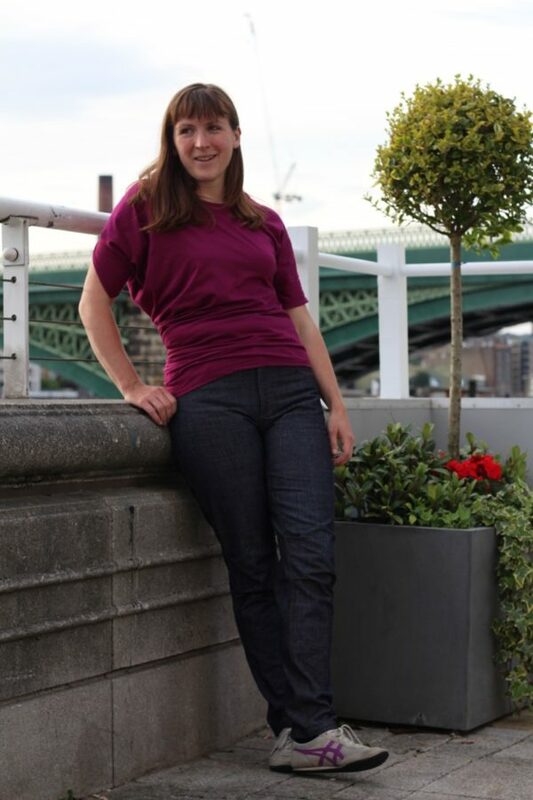 I was asked a bunch on Instagram what pattern I used here, but it’s a bit hard to say – the crotch curve started off as a Burda magazine pattern, but I’ve redrafted the legs, hips, waistband, and pretty much everything else since then, plus I made all my cycling adjustments, and I prefer to do my pocket yokes and fly front in my own way, so I think it’s closer to being a self-drafted than anything else. But I can recommend Named’s Jamie Jeans (stretch denim), or Closet Case Files’s Ginger (stretch denim) or Morgan (non-stretch denim) patterns. Oh, and the top! This was just a quick make as I love my mustard viscose jersey Drape Drape top I made back in 2012, and pretty much every time I wear it (which is like at least once a fortnight) I think “oh I should really make a few more of these!”). So I took some purple cotton jersey gifted to me by my friend Claire (how well does she know my colours!?!) and whipped one up (raising the neckline as before – as drafted it is scandalously low!!). It’s only got two seams, a neckband, and some hems, so it’s an hour start to finish for me (if that). This one fits a bit tighter than my mustard one though, as this jersey doesn’t have anywhere near as much stretch. So it’s a little closer in the waist than I was expecting, and I had to open up the right arm slit and re-hem it since it felt too tight on my arm. But still very wearable, and a good “interesting basic” to have in my wardrobe. But not bad for a weekend’s sewing, and I’m further inspired to sew down my stash of amazing fabrics, and make more clothes which can do double-duty for cycling and workwear! 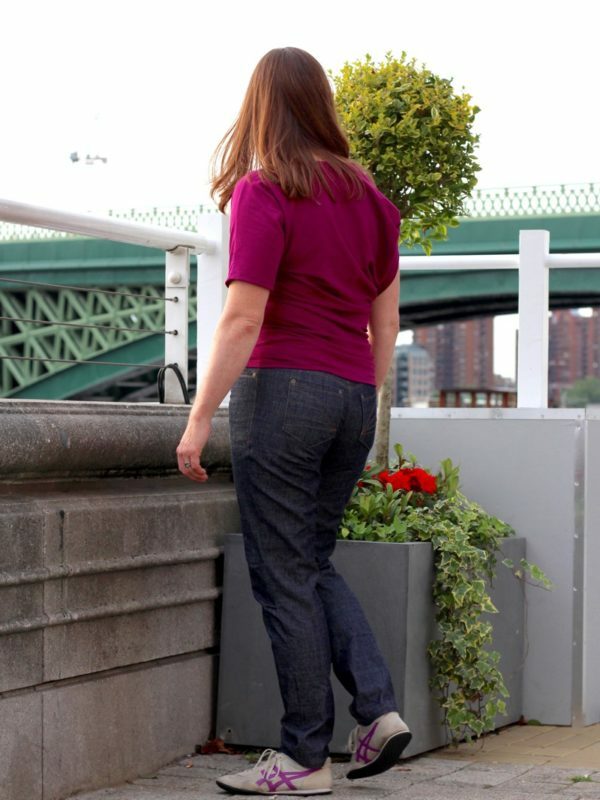 Separator image Posted in Gallery and tagged with drafting, drape-drape, exercise, jeans, knit, top, trousers. Both jeans and top look great! I have to agree on the thread – my machine does not like the green spool at all. Gutterman Mara works fine though. thanks! 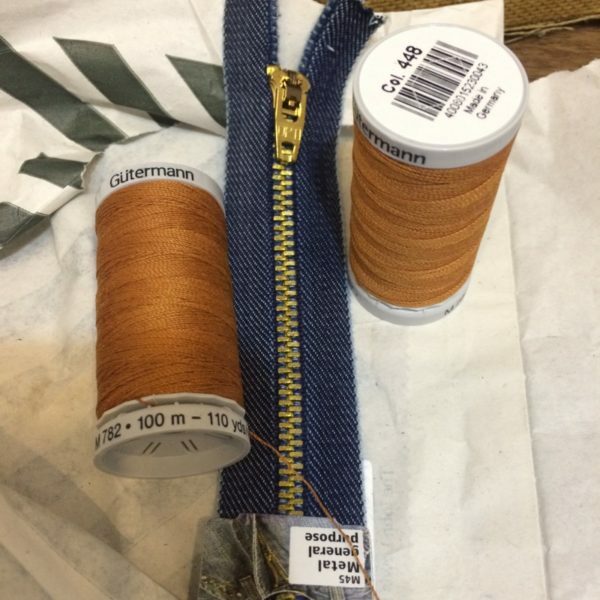 It continually amazes me how many different terms Gutermann have for their threads – it made for a fun few phone calls round London sewing shops on Saturday evening when I needed to buy more to finish them! Thanks for sharing the mods on the jeans! 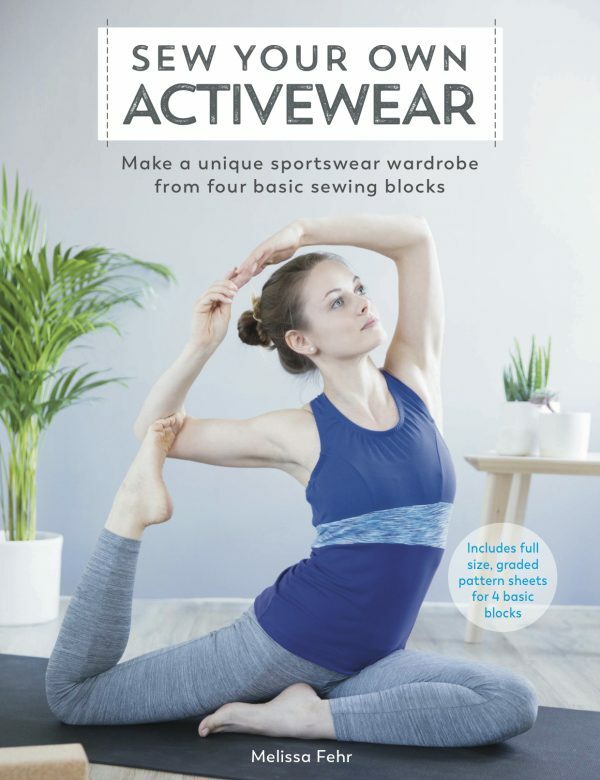 Very excited to try it myself once I get my first pair under my belt (a pair of Gingers in Ditto denim, no less) 🙂 Very inspiring – I like to cycle in “people clothes” as much as I can on my Brompton and save any lycra for the road bike – so stuff like this is invaluable. The colour of the top really suits you as well! thanks so much! I always cycle in “people clothes”, too (unless it’s raining!). My commute is only 35-40min so not really enough to get sweaty, and unlike running, if you’re working too hard you can just go down a gear or two. 😉 Definitely lengthen the upper leg more than you’d think, as a surprising amount of fabric gets pulled up into your thigh crease as you pedal. The jeans look great! Thanks for the supplier links, I will save it for future use! Thanks for the rivet tips and tutorial. 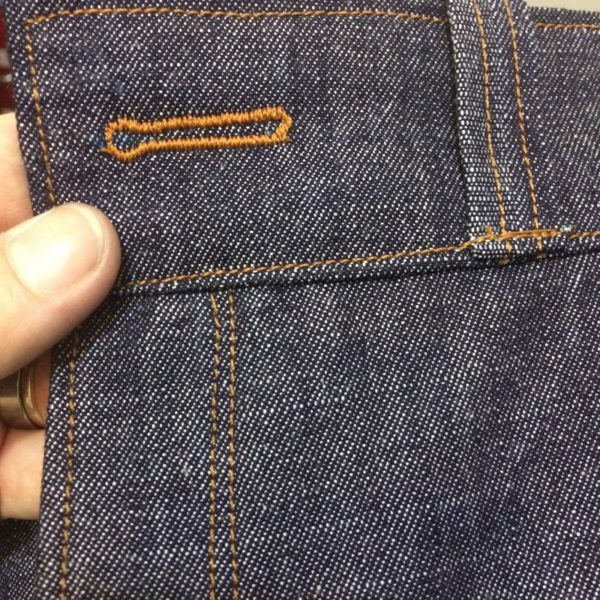 I’ve made jeans before, but I’ve just used bar tacks in place of rivets. I’m gathering materials for some more jeans, and I’m sure they’ll look even better with rivets. I’d totally recommend grabbing some of the all-metal jeans buttons while you’re buying rivets, too. I bought a few but wished I’d bought more as all I can find online are the ones with a plastic shank and metal cap, which are more prone to breakage than the all-metal ones. Thought of you, Mr. Fehrtrade, and other young adults this weekend. 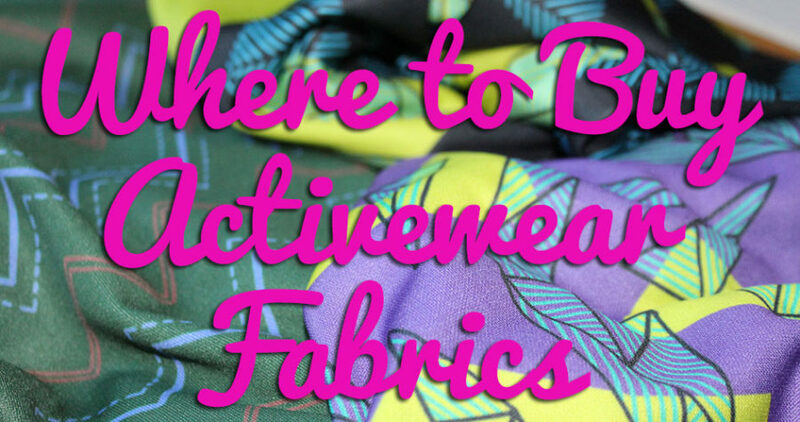 The sewing cave was a good way to go-and the results are outstanding. Btw the photos are beautiful. Also, what weight of denim do you use/recommend? thanks for thinking of us. To be honest, I’m not really sure what weight I’m using as I just buy it in person and go on feel. I personally would get some swatches if I was buying online, as I’m quite picky about the colour/wash, too. 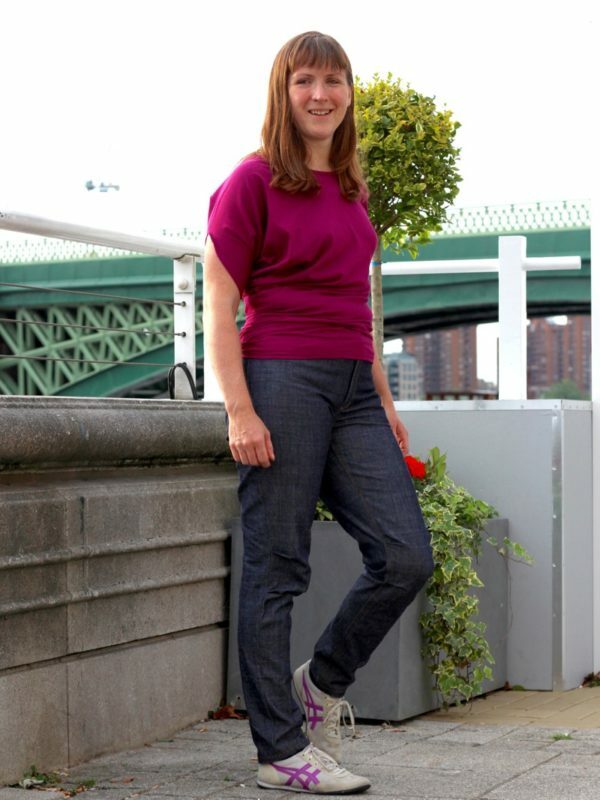 Fab jeans – those pleats are such a smart idea for cycle-proofing them! Very interested in your how-to on the rivets. I was recently mystified by rivets whose nails were too long even after I added extra layers of fabric (in the form of tiny patches on the underside). I looked at multiple tutorials trying to figure out what I was doing wrong. NOBODY suggested cutting the nail down. I ‘m going to attach a note referencing your post to my leftover rivets! Interesting info on the rivets. I’ve only used Prym in the past, and have been happy with them. But next time I’ll definitely consider the ones you recommended and test the difference, though pity that those tiny things have to be ordered all the way from the USA! And the buttonhole you get from the vintage Singer is to die for. Amazing! Thanks for your tips Melissa! 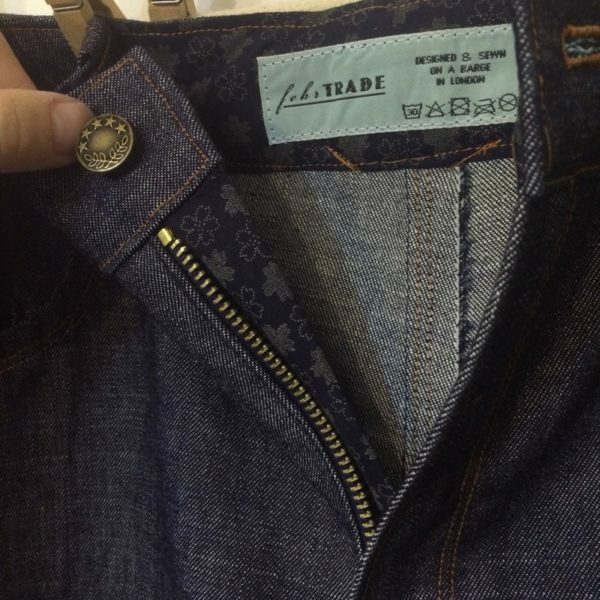 Also, where do you get your jeans buttons & zippers from? 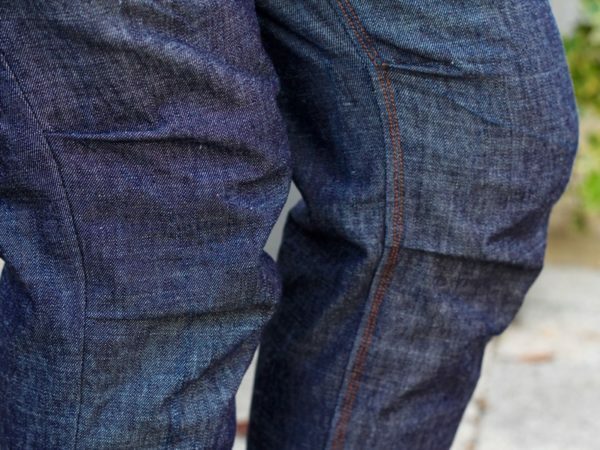 And regarding the pre-washing, do you think if one always wash finished jeans in 30°C water & air dry, would it still be necessary to pre-wash many many time? If yes, is it absolutely necessary to (air-)dry between the pre-washes? Most of the denims I just bought from UK Sherwood Fabrics have lycra, so I’m avoiding putting them in the dryer even once. Do you think that would be a mistake? It looks like Junior’s daughter must no longer be operating the business which is a crying shame! I dropped her an email 6 months ago to see what was up, but never got any reply. 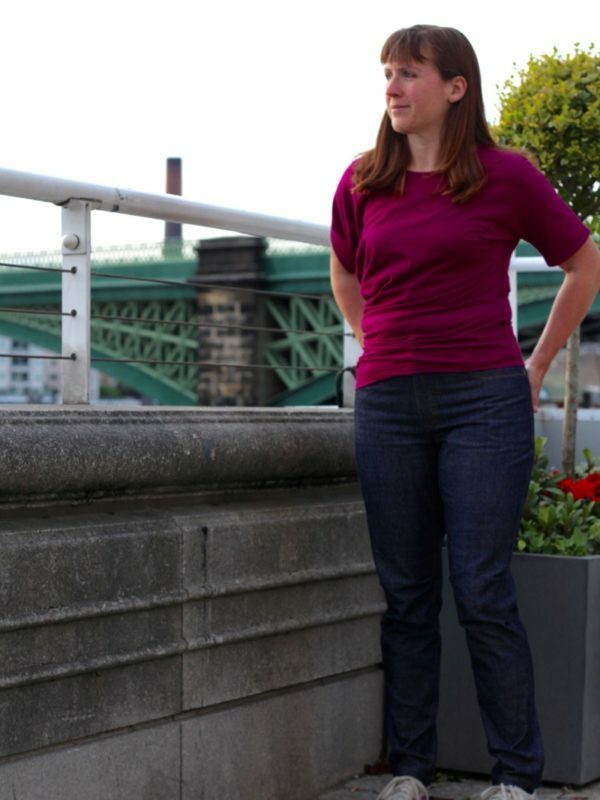 🙁 Heather lists a few alternate jeans rivets suppliers in this post which you could try. As for the laundering, I only ever wash at 30C and air-dry too, and you still will get considerable lengthwise shrinkage in the first few washes with denim. I always prewash mine at least twice before cutting into them. We don’t even own a dryer and shrinkage still happens! Thanks for the warning about the length shrinkage. Do you find the same in all twill fabrics you worked with or just denims? Also, do you air dry the denim between your 2+ prewashing?